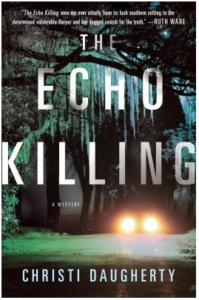 (3.5-stars rounded up to 4) The Echo Killing by Christi Daugherty is an adult thriller following female protagonist, Harper McClain, who is a crime reporter in the city of Savannah. As female leads go, I really liked Harper; I found her to be smart and believable. Although haunted by a past trauma where she stumbled across the crime scene of her murdered mother, we learn how Harper’s whole life was shaped by that one event; how she used it to fuel her passions for writing and reporting. For me, the book didn’t really pick up until about 30% into the story. The introductory phase of the characters, the city and Harper’s early life seemed just a little too drawn out for my taste before ever getting into the main point of our story – the murder and subsequent investigation of a woman by the name of Marie Whitney. Once Harper started looking into Ms. Whitney’s death, and coming to the conclusion that there was more to the story than her police friends were letting on, the action really started to pick up. Overall, I enjoyed this story and would definitely be interested in reading the next book in the series! Thank you to St. Martin’s Press/Minotaur for providing me with an early copy of this book – I am excited for the release date to see what other readers think of it!